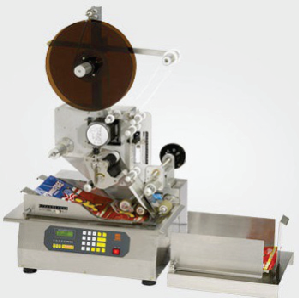 Label Applicator and Feeder system to automatically apply labels directly on flat items like pouches and lids, flat cards. Will apply pre-printed labels from a roll of labels, or it can be integrated to a label printer. Tabletop Pressure Sensitive Label applicator designed to automatically feed labels to flat products: straight-tuck cartons, cards, pouches, paper sheets, bags,sleeves, etc. For products up to 12.75 inches wide. 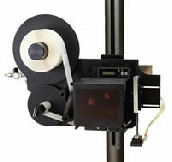 Accommodates Label Rolls up to 10” O.D.